When you’re planning on doing some serious work on your vehicle, you’ll need to jack it up and then keep it up using a set of jack stands. Jack stands are a relatively simple — but critical — component of your car repair pipeline. If your jack stand does its job, you’ll never have to think about it. But if your jack stand drops the ball — or worse, your car — you’ll never forget the headache! In this article, we’ll review a few of the best jack stands on the market and explain what to look for when you purchase a jack stand. How Long Should My Jack Stand Last? How Do I Pick A Set Of Jack Stands For A Car With Odd Dimensions? How High Does My Jack Stand Need To Be? 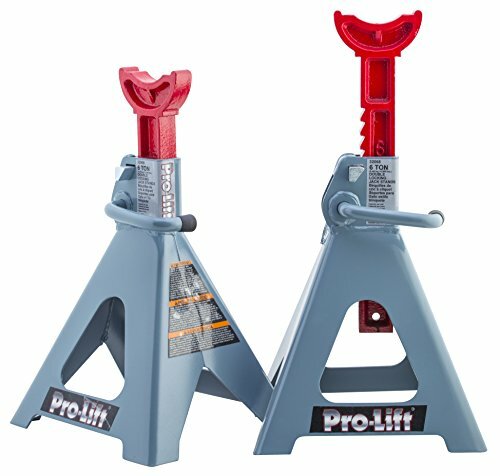 There are a few features of jack stands which you will need to pay attention to while making your selection. First, your jack stand needs to have safety features. It doesn’t matter if you are very experienced or not — this is your life. A jack stand without safety features is an accident waiting to happen. Safety features typically include ratchets and slip-guards. Furthermore, jack stands which are unbalanced or slippery at their base are not safe. You should opt for a jack stand that will not tip over or slide along any surface. Aside from safety features, you should look for a jack stand which is easy to use. The more finicking you have to do to get your jack stand ready, the more tired you will be when you start to work on the car. Most jack stands are fairly heavy owing to their all-metal construction. You can, however, opt for a jack stand made out of aluminum instead of steel or cast iron. The tradeoff is that the aluminum jack stands are typically less durable and more expensive. Durability is a feature that most jack stands have in spades, but you should still make sure to purchase a jack stand that is robust. Anything less would put you at risk. The trick to identifying a durable jack stand is to find the jack stand’s most vulnerable component. For most jack stands, the most vulnerable component is the jack piece itself. Especially if there are any moving parts, the jack piece bears the majority of the load of the car. It also is typically made in a way which directs the load of the car down evenly onto the stand, through itself. While you don’t need to worry about the jack piece breaking after a few jacks, it will be more durable if it is made out of polished metal rather than unpolished metal. Unpolished metal will typically develop scars from the pressure of a car’s weight over time. This is especially true of softer metal jack stands like those made out of aluminum. While it is technically possible to apply the polishing yourself, you should probably simply buy a jack stand with the correctly treated metal to guarantee its durability. The bottom parts of a jack stand are often the least concern as far as durability goes, however. The main concern is that the feet of the jack stand remain uniform. If you plan on transporting the jack stands anywhere, you will need to inspect the feet to make sure that they have remained intact afterward. Good jack stands have the feet of the stand painted in a different color to betray any chipping or trauma with a difference in color. Use this feature to make sure that your jack stand is in good shape. Notably, a few cheaper jack stands lack a differently-colored bottom. Avoid these jack stands. 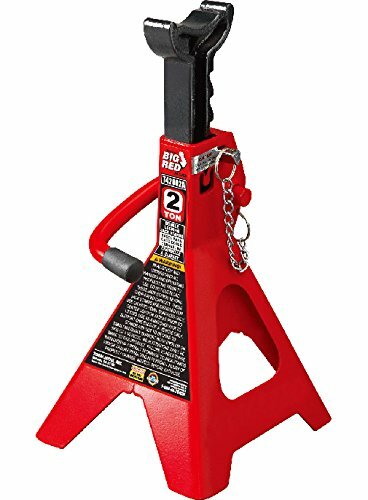 The Torin Big Red Steel Jack Stands with 2-ton capacity is a basic yet effective jack stand which has a decent weight capacity and height. Torin is well-known for their other jacking products like floorjacks, and their jack stands are of similarly high quality. Importantly, the Torin stand has a double-lock protection bolt, which means you are twice as safe as you might be with simpler stands. 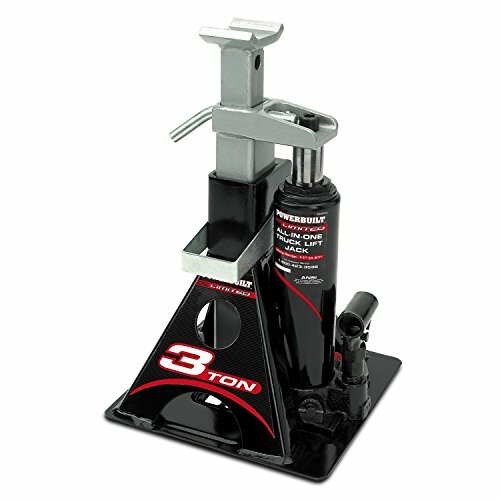 The Torin jack stand has good stability and also good traction. You won’t need to compromise with your car placement thanks to the easy ratchet-based adjustment system. Getting multiple Torin stands on the same level of jack is also easy thanks to the numerical height system. The Torin jack stand has a one-year warranty, but it will probably last much longer than that. You should be wary of cracking the central trusses of the jack stand, however, as they can develop hairline fractures which will break under a car’s pressure. 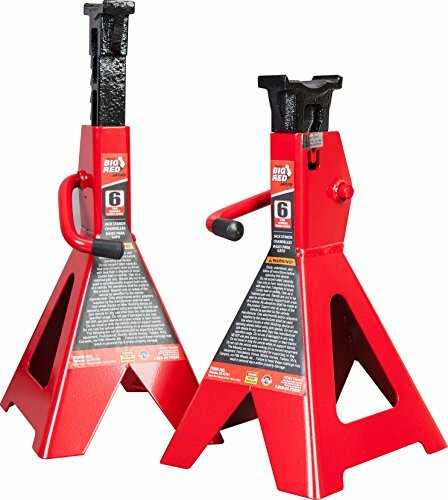 The Torin Big Red Steel Jack Stands with 6-ton capacity is more than a larger version of the 2-ton offering. The 6-ton jack stand is heavier duty, jacks cars nearly 50% higher, and has differences in the safety features. First off, the 6-ton jack stand by Torin can bear three times as much weight as its smaller sibling. This means that this jack stand is the right choice for jacking up trucks and semis. Because of the size difference that this jack is responsible for, its emphases are somewhat different. The safety features of the 6-ton jack are streamlined in favor of strength alone. This means that it probably isn’t a good idea to purchase this jack stand if you are planning on only jacking smaller vehicles. Furthermore, this jack stand’s higher jack height is paired with a substantially larger saddle pad. For smaller cars, this saddle pad might get in the way of making repairs, but for larger vehicles, it’s the right size. Finally, this jack stand is physically taller and wider than its smaller sibling, but it isn’t necessarily any thicker. The vigilance you will need to exert regarding the durability of the jack is therefore significantly greater than in the 2-ton jack stand. The Powerbuilt 640912 All-In-One 3-Ton Bottle Jack with Jack Stand is a safe and user-friendly jack stand which offloads a lot of the difficulties of using jack stands onto the jack instead of onto the user. This jack stand combines a bottle jack to raise cars and a jack stand for keeping cars in place into the same unit. There are advantages and disadvantages to this format of jack stand. First, the jack stand is heavier. This makes it harder to move around and position perfectly. Second, the jack stand is more expensive on a per-unit basis. Jacking up an entire car with these jack stands will be more expensive than using another system. You will get value for the extra cost, however. The jack stand’s safety features are superior to most other jack stands because the bottle jack handles the difficult parts of the jacking process for you. The safety bar will stop the jacking at the desired height. The Pro-Lift T-6906D Double Pin Jack Stand – 6 Ton is a very durable jack stand with fairly good safety features. This jack stand is at the sweet spot between ease-of-use and safety. The stand’s double locking mechanism and heavy duty ratchet bar won’t fail you when you need them most. They also won’t be getting in your way while you are trying to jack the car. The durability of the Pro-Lift jack is hard to overstate. Unlike more complicated jacking systems, the floor jack has extremely durable parts at every segment of the jack. There isn’t a chance that this jack will fail without intentional abuse. Despite its extreme durability and high ease of use, the Pro-Lift jack stand isn’t very expensive, nor is it very unwieldy. The only issue with these floor jacks is that they seem to be in such high demand that shipping times can be very lengthy. 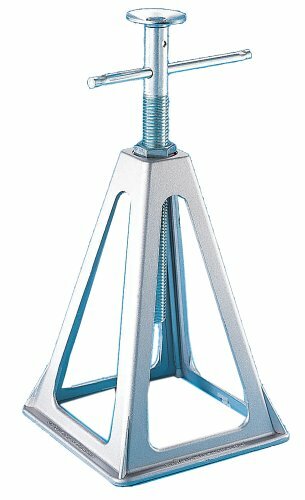 The Camco 44561 Olympian Aluminum Stack Jacks are the simplest possible jack stands that you can purchase. If you know what you’re doing and you’re looking for a budget jack stand, this is the jack stand for you. The Camco jack stand fills the niche for people who understand how to safely jack a car but still need to purchase multiple new jack stands which will serve their needs for limited use. These jack stands are intended for jacking RVs and other massive vehicles. You will probably only use these jack stands as a team of eight or twelve units. The stands are built for this kind of teamwork, and, when working in unison, can bear up to 6000 lbs each. These jack stands will also jack your RV up to 17 inches, which is fairly standard. The issues with these jack stands are that they lack safety features and also ease of use features. You are on your own as far as protecting your RV — and your life — goes. The stands are lightweight thanks to their aluminum construction, and they aren’t particularly durable. Nonetheless, if you are an expert at using jack stands, you could use these jack stands effectively. Most jack stands will physically last for as long as you would ever want to use them. They’re made out of heavy duty metal without exception. However, you may not want to use a very old or battered jack stand because of how important safety is when jacking. You should probably expect your jack stand to last 20 years or so, but with heavy abuse they will last as few as 5 years. The best jack stands for cars with odd dimensions are typically smaller jack stands. Because they are smaller, you can fit them into odd crannies in a car body with less effort. You can also multiplex smaller jack stands much more easily than with larger ones. Whatever you do, do not buy several different types of jack stands and then mix them while you are jacking a car. You should only be using multiple iterations of the same type of jack stand whenever you are jacking the car because anything less would make things uneven and dangerous. The standard jack stand height is 16 inches. For most types of cars, this is a sufficient height. For cars that are very low to the ground, you may need to get a jack stand which jacks higher. Likewise, for very large vehicles, you will probably want to get a jack stand which jacks a bit higher. The thing to remember is that jack stands have a minimum jacking height as well as a maximum. This means that your jack stand selection needs to be made with your floor jack in mind. If your floor jack’s maximum jacking height is less than your jack stand’s minimum height, you’re going to have a very hard time getting your car to stay on the jack stand. You should also take into account the amount of room that you need to work when you are using your jack stand. Most roller mats which you will use to slide under the car will take up a few inches of space. Likewise, your body will take up a good deal of space when it is perched on the roller mat. You will also need some room for your hands to work while you are underneath the jacked car. Try to pick a jack stand where there is a large amount of overlap between the stand’s height capacity and your floorjack’s.